Recreational anglers, scientists and fisheries managers are working together to generate data that will improve our understanding of the current status of local bass populations. Researchers from Scripps Institution of Oceanography Lyall Bellquist and Brice Semmens are partnering with the Southern California recreational fishing community, the California Department of Fish and Wildlife and the San Diego Oceans Foundation to conduct a fisheries research project funded by Collaborative Fisheries Research-West. The goal of this project is to measure the relative population sizes, mortality and movement patterns of barred sand bass, spotted sand (bay) bass, and kelp (calico) bass in the San Diego coastal area. This is being accomplished with a large-scale fish tagging effort aboard local Commercial Passenger Fishing Vessels or “party boats” chartered by the San Diego Oceans Foundation. Recreational anglers are invited to go fishing for free aboard these charters, with the understanding that all fish caught must be tagged and released. Recreational anglers can sign up for these tagging charters online at cooperativefishtagging.org. Tagging efforts are also being conducted aboard private vessels. Bellquist is currently training anglers to tag and record bass themselves, which will significantly increase the tagging efforts — especially in San Diego Bay and Mission Bay. All bass caught are tagged with external ID “spaghetti” tags in the muscle just below the dorsal fin. Each tag has a specific ID number, the Scripps research laboratory’s phone number and “REWARD” printed along the side. If someone catches one of these tagged fish, they can call the printed phone number to report their catch information, which will enter them in a monthly raffle for a $200 gasoline card. They can also report the recapture online at cooperativefishtagging.org. 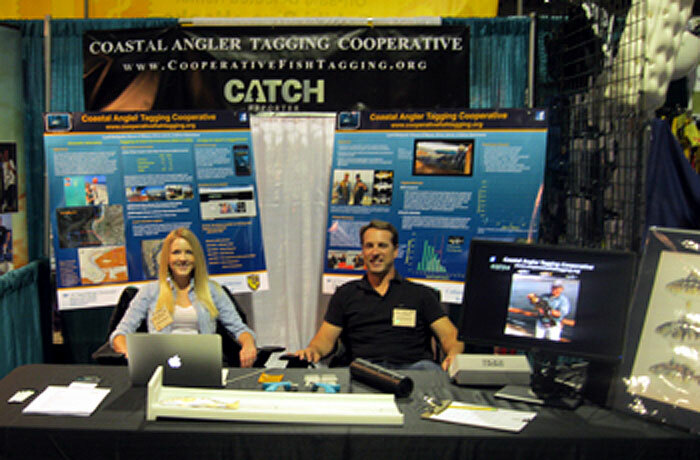 Check out the Coastal Angler Tagging Cooperative/CATCH booth at the Fred Hall Del Mar Show.